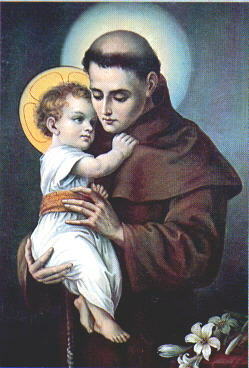 Ferdinand--for this was the name Anthony of Padua was known by for many of his years--had turned his back on the life appointed for him by his noble and wealthy parents in favor of a life of monastic discipline and devotion. He received a competent education in the Augustinian school but in doing so turned down the excellent education offered by his family's connections and influence. Regardless of the opportunities offered to him, though, Ferdinand was only willing to live the life that God had called him to live. In pursuit of his calling, he became the monk in charge of hospitality at the Augustinian abbey of Saint Vincent outside the city walls of Lisbon, Portugal. One night he gave rest and comfort to five Franciscan monks who were traveling for Morocco to preach to the Muslim inhabitants there. Ferdinand was energized by their clearly passionate obedience to the calling God had placed upon their lives even in the face of probable death. He was not surprised when he soon hosted them again--though this time it was their corpses he cared for--at the abbey as they were sent home from the mission field as martyrs. Each of the men had died for a Kingdom that places demands on its citizens and a Lord who promised life through death. Impressed as he was by their bravery and commitment, he asked for and received permission to leave the Augustinian abbey and become a Franciscan monk. Upon this occasion, he took the name Anthony. Anthony had become a Franciscan so that he might follow in the footsteps of the men whose callings had been so clear and sacrifices so definitive. He soon set out to travel to Morocco to take up the calling of the men who had been martyred. Anthony made this decision knowing that his own martyrdom was the likely outcome of such a calling but he went willingly and eagerly. While traveling, however, he became severely ill and was forced to turn around and return to Portugal to seek medical attention and time to recover. Anthony was heartbroken that he would be turned back fromMorocco and what he perceived to be his calling but he did so knowing that God's will could not be frustrated and that if it was God's will for him to go to Morocco then he would find his way there. Yet again, though, circumstances changed for Anthony when his ship was wrecked on the coast of Sicily. Anthony had no connection to Sicily but it seemed as nice a place as any for him to recover and continue his life of monastic service and devotion. He had the opportunity to go to Assisi and after the occasion of his presence passed he remained there as a servant of God who seemed lost in his calling. Anthony must have felt adrift in God's plan to be so far from home and so far from anywhere he had ever imagined God guiding him. In Italy Anthony was an unknown and of no consequence. Yet, Anthony continued to wait for God to do God's will and allow him to join into the work of the Kingdom in the world--he was content to wait on God's guidance because he trusted that God's calling upon him was true and complete. Anthony ended up in San Paolo because of his illness and his relative obscurity among Italian Franciscans. One day a group of Dominicans and Franciscans gathered together for the purposes of an ordination. The Franciscans had assumed that surely the Dominicans would be prepared to preach--after all, the Dominicans were the Order of Preachers. The Dominicans had assumed the Franciscans would have a preacher since they were hosting the day. Consequently, nobody was prepared to preach on the occasion of the ordination. The monks decided that humble Anthony would preach and he objected to their insistence. They overruled him, though, and he was compelled by his obedience to his brothers and his Lord to do as they asked. He ascended to the pulpit and swallowed nervously. Finally, he began preaching whatever it was that the Holy Spirit directed him to say. At first, it was halting and hesitant but as the Spirit gripped Anthony the words came clearly and powerfully through him to the attentive audience. They were astonished at the clarity of the words he brought forth on that day and he gained a reputation of spirited preacher in the small community. His reputation began to spread from that day and soon he was not only preaching sermons to the many who were desperate to hear words of hope, faith, and love but he was also working wonders in the crowds that came to see him. The man who feared he had missed God's calling found it seemingly by accident when called upon to preach the Word of God. For the rest of his life he preached and worked wonders and lived into the wondrous calling God had known from before his birth and Anthony only found out a day at a time.